De Buys Genealogy: Who was Coenraad De Buys? Who was Coenraad De Buys? Jean De Bus, a wine farmer from Calais, arrived at the Cape with the French Huguenots onboard De Oosterland on 25 April 1688. He married a French woman, Sara Jacob, and his son Jean and grandson Jean (sometimes known as Jan) married Cape Dutch women. This last marriage produced a number of offspring including a son, Coenraad De Buys / Buys. Coenraad is regarded as the stamvader (progenitor) of the De Buys/Buys people. By 1773, about eight homesteads had been built in the Long Kloof. The pioneers of the area included Jan De Buys on the farm De Ezeljacht. He was the father of Coenraad De Buys. Coenraad was born on the farm Wagenboomrivier in 1761. He had his own farm, De Opkomst, near Kareedouw/Montagu. When Coenraad was around 7 years old saw his father sitting on a chair "with his legs drawn up as stiff as planks". He was clutching his stomach and screaming. All that night he writhed in pain and died the next day. Coenraad walked to his half sister, Geertruy's house and hold her about the death. Geertruy told Coenraad that she had seen another man die in same way - her father, Christina's first husband, Dirk Minnie. It is widely believed that Christina had poisoned them both. Coenraad decided not to go back home and lived with Geertruy and her husband, David Senekal, raising the livestock he received from his father's estate. Christina married David's brother, Jacob Senekal within six months. In the 1780s he settled on a farm near the Bushman's River in the Zuurveld with his first wife, a Coloured/Khoi woman by the name of Maria Van Der Horst and they had 7 children. Maria was of slave descent. He also had many Xhosa wives. He later crossed the colonial border to live in the kraal of Chief Ngqika. He took Ngqika's mother, Yese, as his wife and became the main adviser to the chief. He also took another wife from the Thembu clan and had children with her. During this time Coenraad was one of a number of white and coloured people who were on the Xhosa side in the frontier wars against the Boers and then the British. From 1799 the Rharhabe chief Ngcika (also known as Gaika)’s "Great Place" was shared by his erstwhile friend "Khula" or Coenraad De Buys. This place was apparently in the Tyumi river valley, just south of Hogsback. On 20 Sept 1799, Dr Johannes Van Der Kemp, a missionary from the London Missionary Society, met Coenraad De Buys in Kaffirland, where Coenraad acted as interpreter for van Der Kemp with Ngqika. Over that year and the next Coenraad and Dr Van Der Kemp's friendship grew. Coenraad married or cohabited with several indigenous women, including the niece of the great Matabele king, Mzilikazi. Three of the nine offspring of this latter union, the brothers Michael, Gabriel and Doris, played a decisive role, not only in the establishment of Buysdorp and the early dynamics of the region, but were eventually instrumental in the development of a value system of exclusivity despite a lifetime of intensive involvement with other people in the area. Michael, the second born of his nine recorded offspring, eventually was the first recognised leader of the Soutpansberg Buys people in their present whereabouts. His older brother was Gabriel and his younger brother was Doris. Around 1812 Coenraad was living in George again, but soon had a falling out with Martha Ferreira. At her trial witnesses testifed that Martha beat her slave Manissa almost daily with a shambok (type of whip) and even caused Manissa to loose one of her eyes. On one particular day Manissa was sent to fetch wood. when Manissa didn't return after a while Martha followed her, but returned home without her. Later, about a half hours walk from the farmhouse, a bundle of firewood which was tied with twine (made of tulip petals) was found. At that same location was a trail of bloody footprints, puddle of blood, a piece of taaiboshout (hardwood), drag marks, 'n karos and the small footprints of Martha Ferreira. This incident took place while Martha lived in a blockhouse; this was more than likely at Fort Frederick. Fort Frederick was built in 1799 to defend the mouth of the Baakens River, Fort Frederick stands overlooking the Port Elizabeth Harbour. Martha further testified that Manissa suffered from "Mozambiquean sickness" and that she died from bloodletting, adding that the night before her death, Martha looked after her for the whole night, reporting her death to Veldkornet Jan van Niekerk, her brother. She had her slave, Esua bury Manissa. Several other cases were brought against Martha and, over time, the hearing at George concluded. Martha Ferreira was completely acquitted of some of the cases, while others were dismissed due to lack of adequate witnesses. The only charge to which she was convicted, was wounding a slave on his head, for which a fine was imposed. During her trial at George, Coenraad de Buys testify against her, thereby further alienating himself from the community there. In 1813 Coenraad moved north to the central region of the Gariep River and gathered his extended family together with allies from the Khoi, Oorlams Afrikaners, Basters and Xhosa. Coenraad De Buys preceded organised trekking - he was 54 years old when he became a fugitive from a Boer rising in the eastern Cape Colony, suppressed by the British in 1815. In 1818 he moved northwards again, into what is now the Limpopo province. Coenraad De Buys was reported to be at Karechuenya and was short of gunpowder, which he had been importing from the Cape. 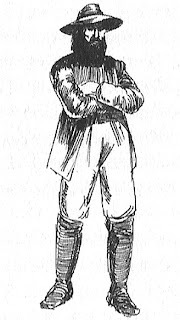 Now he had to get supplies from Delagoa Bay, so he sent his companion hunter-trader Joseph Arend (an escaped slave from the Cape) to try the direct east route across the Drakensberg. Arend's way forward was blocked by hostile "Tebele" (the Malete of Kgosi Poo 11, ruled c. 1805-20), living between the later Rustenburg and Pretoria. The Hurutshe attacked Poo aided by De Buys' firepower, but failed to dislodge and replace him with their pretender to his throne, Boikanyo. Coenraad was known among the Hurutshe as Mora, derived probably from his morning salutation in Dutch, though the word mora also came to mean coffee-grounds in Tswana. Among his "Tebele" enemies, such as the Laka and Malete, he was known as "Diphafa", apparently in reference to the feathers he wore in his hat, alternatively meaning "big beer pots" - maybe because of his middle-aged bulk and capacity for drinking beer, or maybe because of his booming voice and booming gun. In 1820 Coenraad decided to move north down the Madikwe (Marico) River into the Limpopo valley. The Tsonga and Afro-Portuguese in the valley could supply him with gunpowder in exchange ivory. He settled above the tsetse-fly and malarial belt in the Tswapong hills east of Palapye, in present day eastern Botswana. During the trip Elizabeth contracted yellow fever and died where they had settled. An already old, and for long unwell Coenraad was distressed. He undertook a last journey to Mozambique and asked his sons and their families to wait for him at the border, the Limpopo river. He never returned. The Ngwato chiefdom was then living at nearby Serowe - present day Sekgoma Memorial Hospital. Ngwato oral tradition relayed by the historian SEBINA recalls Coenraad De Buys as "Kgowe" - the first mohibidu or "red person" that the Ngwato had seen. Ngwato tradition adds that the three older sons of Buys - named Kadise, Toro and Toronyane - disappeared from the Tswapong hills after the death of their father. They left behind a young brother, in the care of his mother. His name was Mmegale. He became a herd-boy among the Ngwato, and was initiated into the Malekantwa regiment which is dated around 1834. Dr. David Livingstone found Mmegale among the Ngwato, then aged about 27, in 1847, working as the servile gardener of an Ngwato master. Mmegale told Livingstone that he had two more brothers "he informed me... in servitude to another tribe". The Birwa living around the Blouberg hills of the Northern Province recorded the arrival of Coenrad De Buys (junior), Michael De Buys and Doris De Buys, who settled among them as hunter-traders in close contact with the Tsonga and Afro-Portuguese of the East Coast. These De Buys’ of mixed Boer-Birwa origins, helped the first Trekkers in the north - first the scouting party of Scholtz in 1834-35, then the Trichardt and Jan Van Rensburg treks in 1835, and the Soutpansberg colony of Potgieter in 1848. Robert Wagner gives the following birth and death dates: Coenraad De Buys 1761-1822, and his sons Gabriel (1808-55), Theodorus Comelis (1810-51?) and Michael (1812-88). The missionary-trader Sam Edwards, interviewed in 1913, said that Coenraad De Buys died of fever on the Limpopo. Sebina states that Coenraad lived and died in the Tswapong hills. Death from malaria is highly likely. Michael, Gabriel and Doris, with their families as well as other Buys’ at first settled on a farm at Goedgedacht and later at Kranskop in the Soutpansberg. Michael arranged for a Scottish missionary couple, Reverend Alexander Mackidd and his wife, to come to live and to work amongst the Buys people and this they did from 13 May 1863. It was this missionary who facilitated their access to these farms which belonged to neighbouring farmers. In the early years of Schoemansdal, one of Coenraad's sons, Michael, was not welcome in the church. The 11000 hectares of land which today comprises Buysdorp is situated in the foothills of the Soutpansberg in the Limpopo Province. The farms Buishoek No. 54, Buisdorp No. 37, Buisplaats No. 51 and Mara No. 38, belong to the Buys families. Buiskop, the mountain, is situated approximately four miles north of Warmbaths. It was used as a halfway house during the ZAR days for the mail coach that travelled between Pretoria and Pietersburg, fresh horses were provided here. The mountain was also found to contain a sandstone formation and this stone was used for the erection of a portion of the Union Buildings. The mountain was named after Coenraad De Buys. Oral history relates that he and his followers were trapped by local tribesmen on the mountain. The natives tried to get them to surrender by thirst, eight days later Coenraad made his appearance and dumbfounded the natives who were expecting surrender, to see him swinging a skin of water over the top of the mountain and declaring that he had certain higher powers on his side that enabled him to get water on the dry mountain top. Terrified by this state of affairs the natives decided to cease hostilities and put an end to the siege on Buiskop. Michael often related how his father Coenraad read to the family from the Bible and prayed. The Buys' had by now, in general, Michael included, adopted the practices of the local black communities, polygamy included, circumcision being the only one strongly discouraged by him. He soon forbade his children to marry more than one wife, although he ‘took’ some 20 women in the course of his life ­ he did however eventually relinquish all but one of these wives. Both the influence and the demands of the mission and the missionaries resulted in the Buys' increasingly rejecting what was regarded as heathen customs and practices. They regarded themselves as superior and demanded to no longer be part of a mixed congregation and to be educated separately and not in Sotho but in Dutch. Michael was concerned about the future of his offspring. He wanted to prevent further ‘verswarting’ (blackening) and purposely endeavoured to ensure that marriage should only take place between ‘those of a kind’. In his view whiteness of skin was the Buys' most important asset. The constitution of the Zuid­Afrikaansche Republiek at that time stipulated that no "coloured person" may enjoy civic rights. The Buys', because of services rendered to the State, received several rights denied blacks, e.g. the right to carry guns. Secondly, Makhado, the Venda chief in the area at that time, refused to allow missionary ministration to his people and also refused to hand over rifles obtained from traders. Michael acted as facilitator between Makhado and the Boers/Missionaries but negotiations failed and the mission station was subsequently attacked and burnt down by the Venda. The Buys' then joined the missionary Hofmeyr in seeking refuge in the Boer encampment. A church and a school were eventually built and a succession of missionaries ministered to the Buys'. Michael, at the age of 76, led a delegation to President Paul Kruger in Pretoria to apply for land for his people. The land now known as Buysdorp, was at first named after the Biblical Mara (still the name of one of the four farms, and the primary school is called Mara Primêre Skool), place of bitterness, because of the hardships endured. These "services rendered" stemmed from early cooperation with the Voortrekkers advancing into the region, and the establishment of a pioneer village, Schoemansdal. Gabriel and Doris acted as guides and interpreters for the Voortrekkers and hunted and generally lived in close association with them. With the British annexation of 1871 many of their semi-privileges and semi-rights were taken away. The Buys' cast their lot with the Boers against the British in the First Anglo-Boer War (1880-1881), but particularly during the Second Anglo-Boer War (1899-1902). Some Buys’ acted as wagon drivers and attendants ­ 158 of them ended up in the Pietersburg concentration camp where a number of them, ranging in age from 2 months to 80 years, died. Several other De Buys’ were held in the Potchefstroom and Kimberley concentration camps. Buysdorp had cultivated lots (mainly for maize and vegetables), irrigation canals and roads, a church (Verenigde Gereformeerde Kerk), a school, a community hall (President Paul Kruger Gemeenskapsaal), shops (Gemeenskapswinkel), post office building, clinic (the old parsonage), police station, cemetery and the school’s sports field with a small pavilion. From the mid-1900s the original wattle-and-daub huts gradually gave way to permanent brick houses. Also on Buys land but to one side, is the Thalane settlement, a small community of Venda and Northern Sotho-speaking families who have provided domestic and agricultural labour for the BUYS' for generations. Documents entitled Crown Grant No 80/1909 confirm that the land in question had been "ceded and transferred" to Coenraad, Jeftha and Benjamin Buys, "in their capacity as representatives of the Buys Tribe" by the Deputy Governor and Minister of Lands on behalf of His Majesty Edward the Seventh. It is also indicated that they shall “possess this land in perpetuity”. Buysdorp is managed by a Management Committee of five males. The Management Committee is an instrument of the Family Council, and instruments of the Management Committee, in turn, are the General Assembly, the Upper House, the Ceremonial Family Heads and the Secretary. Family members above the age of 18 years who hold lots, or who are married to the holder of a lot, have the right to vote. The descendants (over 18 years of age) of lot holders who live on their parents’ lot as well as their legal spouses who live on the lot with them, likewise may vote. The Management Committee controls the allocation of lots. To qualify one has to be born a BUYS, be descended from one or married to one. Only those who qualify are allocated sites or granted access to agricultural or grazing land and are allowed to erect permanent structures. Coenraad, nearly seven feet tall, with an engaging personality and presence, had a chequered career. He was at different times an adventurer, elephant hunter, farmer, outlaw (as per the British administration at the Cape), outcast, rebel, facilitator and interpreter for missionaries, cattle rustler, leader of a revolt, confidante and advisor to a powerful Xhosa chief (Ngqika) and even instated as chief of one of the northern interior tribes. Through a sequence of Xhosa, White and Khoi and Tswana wives Coenraad is thought to have had around 3000 grandchildren and is a prominent ancestor of Xhosa, Khoi, Coloured and White South Africans. Coenraad and Maria Van Der Horst are my great- great - great - great – great-grandparents. "His roles and activities on the frontier were many. Authority during the last decades of the eighteenth century saw him as the most evil and dangerous influence there. He was as much a cause of the Second Frontier War between colonists and Xhosa chiefdoms as the Prinsloos were of the First. ...Much later, in the nineteenth century, de Buys would be seen in northern parts, in the vicinity of the Orange River, a quasi-chieftain among the Bushmen, urging them to turn against the missionaries in their midst; and still later, leading the numerous clan of half-castes he spawned ever deeper into those parts of the interior beyond all possible contact with authority....Coenraad de Buys was a wild, cunning, sly, brutal and ambiguous figure..."
I found your blog because I am a direct descendant of Jean de Buis which makes Coenraad du Buis my 1st cousin 6X removed. His story is fascinating so, if you don't mind, I'd like to add it to my family tree. One question, however: why is Coenraad regarded as the 'stamvader' of the de Buis family instead of his grandfather? Hi Tony. Hope you can assist. I am stuck trying to find the link between the Niekerk surname and the Buys surname. Do the names Hermaans with daughters Anna and Elsie ring a bell? Please answer if you can. Unfortunately not - I don't have a family which resembles this. Can you supply some dates to put the info into context? Anna and Elsie are old (+1 1700/1800) names in the De Buys family tree, but could also be in the Buys family tree which descended from Barend Buys he came to SA in 1715 whereas Jean De Buys came to SA in 1688.